Metal-organic frameworks (MOFs) provide a versatile platform for tuning the chemical functionality of pore surfaces and thus have attracted an increasing amount of attention for applications in gas storage, molecular separation, sensing, and catalysis. In contrast to the widely-studied carboxylate-based MOFs, sulfonate-based MOFs have been significantly less investigated and exhibit a lower degree of structural predictability, which can be attributed to the versatile coordination modes of the sulfonate monoanions (RSO3–) to the metal. Fig. 1. Crystal structure and topological graph of TMOF-2. However, permanently porous MOFs constructed with organosulfonates (i.e., alkylsulfonates or aromatic sulfonates) as organic linkers may offer a functional platform for highly polar pore surface including potential applications in chemical recognition and/or separation as well as proton conductivity. Engineering of missing metal-linker connectivities in MOFs is an intriguing phenomenon for tailoring their properties, such as enhancing their gas sorption and catalytic performances. This type of crystal irregularity will bring advantages to realize coordinatively unsaturated metal sites and/or dangling functional groups (i.e. linker-pendant, rather than node-coordinated), thus strongly affecting its mass-transport pathways. Inherent defects occur in several MOFs possessing a low degree (<10 %) of the missing metal-linker connectivity, which drastically enhanced the catalytic activity and gas sorption properties. The design of proton-conducting materials is of great interest in the proton-exchange-membrane fuel cells, which are considered as a promising system for converting clean H2 fuels into electricity. The well-developed perfluorosulfonic acid polymers (e.g. Nafion) reach a high proton conductivity of 10-1 to 10-2 S·cm-1 under humid conditions. However, they require functionalization with sulfonate groups, and have limited stability owing to their organic nature. Fig. 2. Highly hydrophilic pore channel in TMOF-2 which faciliates the proton transfer. In this work, we employ a linear organosulfonate (1,4-benzenedimethanesulfonate, 1,4-BDMS) and a linear N-donor 4,4’-bipyridine (4,4’-bipy) as mixed struts to construct a highly porous 3-D “I0O3” network, using Cheetham et. al.’s proposed nomenclature. The resultant organosulfonate-based MOF (TMOF-2) affords a high porosity of 37.2 %, and demonstrates high robustness over a wide range of pH as well as aqueous boiling conditions. 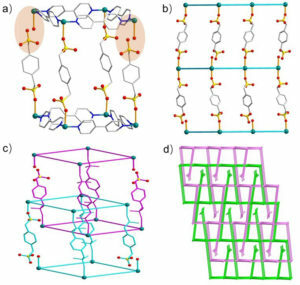 Due to the rather weak coordinating tendency of the sulfonate groups, X-ray crystallography of this Cu(II)-based MOF unambiguously revealed the presence of the missing metal-linker connectivity in the framework. This unprecedented crystal irregularity achieves a dense, ordered array of the free (non-coordinated) sulfonate groups and the coordinatively accessible Cu2+ centers. The inherently missing Cu2+-sulfonate connectivity in the interconnected pore channels shows a remarkably enhanced proton conductivity of 1.23×10-4 S·cm-1 (90 °C, 98% relative humidity), which is over two orders of magnitude than the other sulfonate-based MOF with a complete metal-ligand connectivity. This is the first example of proton conductivity control in a MOF using its missing metal-ligand connectivities. The pendant sulfonate groups along with the “inert” nature of the MOF significantly enhance the proton conduction of the material. This work opens a promising route in rational synthesis of porous, robust sulfonate-based MOFs with missing metal-ligand connectivity and related properties. 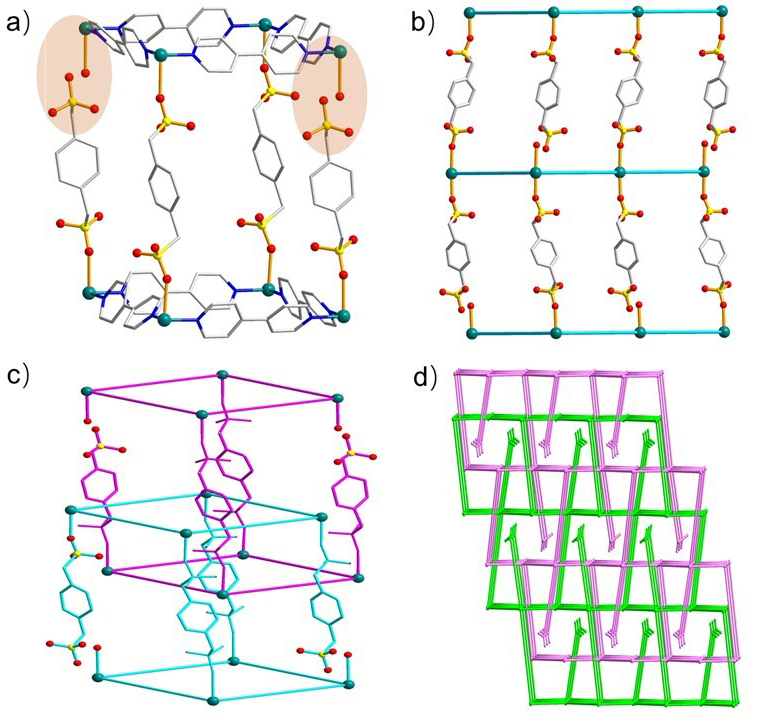 Missing metal-linker connectivities in a 3-D robust sulfonate-based metal-organic framework for enhanced proton conductivity.